Fuerteventura is a part of the Canary Archipelago and is a long island with an extension of about 100 km from North to South. Due to its proximity to Africa, its beaches are formed by Saharan sand carried to the island by a hurricane named ‘Siroccos.’ The island is also characterized by strong winds coming from ‘Azores’, making it an ideal location for windsurfers. It offers several conditions, ranging from flat shallow lagoons to on-wave sailing spots. 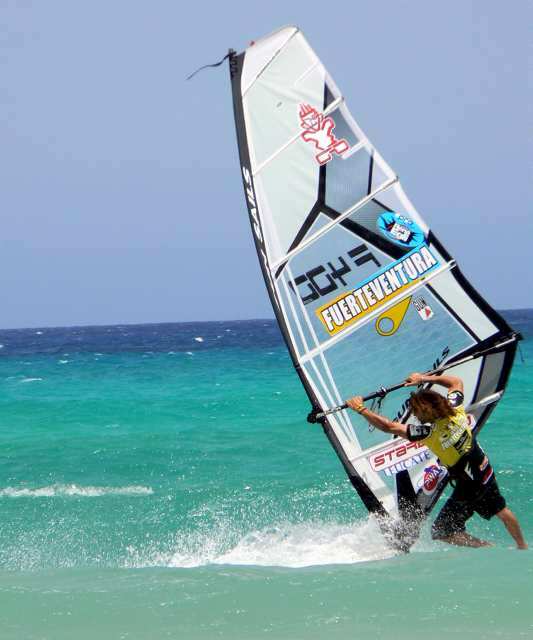 Fuerteventura is a popular destination for windsurfing, as strong trade winds blow throughout the year. Summer is the windiest season in the island because of a high pressure belt over the Atlantic and a low pressure over the Sahara. The combination leads to cross-shore winds. In the winter season, depressions in the Atlantic cause rising tides that bring favorable waves for surfing. The north has favorable conditions during the winter, whereas the south has favorable conditions during summer. Fuerteventura offers a great variety of sailing for both speed sailors and wave sailors. There are several locations around the island, each with certain characteristics depending on whether the surfer is a beginner or expert. Beginners are usually found in the cove of Caleta de Fuste as the waves are not quite challenging. They begin with no sail, then go for a small one, and finally to a big one before they head to the more challenging waves. The Corralejo bay is for experienced surfers, as the western side of Fuerteventura has stronger waves and currents. The strongest winds are experienced in Playa de Sotavento. Other places to surf are El Cotillo and Playa de Esquinzo. The Fuerteventura surf camp provides an ideal surfing holiday. It is situated in the best part of Corralejo, with effortless access to shops, supermarkets and restaurants. The best location, comfortable accommodation, favorable weather and strong waves combine to create an unforgettable experience for vacationers. Professional surfing tuitions are also offered. People from around the world get to join in the camp and share their surfing experiences. Windsurfing is a difficult sport as the surfer has to depend completely on the wind. The art of windsurfing requires surfers to dance with the wind and move with confidence, otherwise they can be swept into the sea. Therefore, it is best to undergo a windsurfing course before venturing into the sport.